A sedentary lifestyle contributes significantly to health problems, such as the increased occurrence of obesity, type 2 diabetes, cardiovascular issues; the list is endless. Allocating a minimum of 30 minutes of physical activity per day (walking, jogging, attending the gym, home exercises) not only controls weight gain, but helps with weight loss, improves self-confidence, and increases self-awareness. 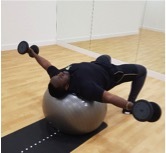 One of the popular pieces of fitness equipment is the Swiss ball as we all know it, or stability ball as it’s officially named. According to biomechanics and scientists, the benefits of including the stability ball in a regular workout routine are tremendously high, especially when we are considering the ball’s instability on floor/surfaces and its versatility. 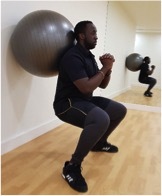 The Swiss ball could be used for a warm up routine, as a main workout or for cooling down, for low impact exercises or high intense ones. 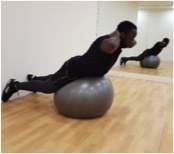 Anyone can use the stability ball too; from children, to experienced athletes and elderly people. In the past few years, many specialists started to recommend the Swiss ball as an office chair for people spending more than eight hours sitting in front of their desk – as a form of active sitting. There are many benefits that can be taken from including the Swiss ball in a daily workout routine, so we recommend you try a few of the useful exercises below. 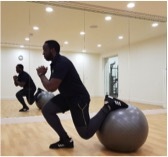 You can incorporate the stability ball in your daily routine, or you can choose the Swiss ball as a separate routine! Acknowledgements: I would like to express my gratitude to David Gordon, our motive8 team member, who voluntarily participated to demonstrate the exercises.